The latest build of the game can be downloaded here. However, please don’t just ignore the rest of the blog post…I’ve written some important stuff down below. Fixed bug that would make Yandere-chan get arrested if she was carrying a bloody weapon in her inventory when leaving school. Fixed bug that would cause the “Now Loading” image to be permanently stuck onscreen when loading the Photo Gallery. Fixed bug that would cause a fleeing student’s body to move towards the school’s exit during their death animation. Fixed bug that would allow the player to see the “Quit Game?” window at the “end-of-day results” screen. Fixed bug that would cause the wrong “end-of-day results” text to appear under certain circumstances. Fixed bug that would cause the cardiograph monitor to appear at the “Study Points” screen. Fixed bug that would trap students outside of school if you rushed to school too quickly. Fixed bug involving the water bucket that would actually cause the game to crash. Attempted to fix the “Students spin when walking up staircases” bug. Fixed bug that would change the color of the sky at the title screen. Fixed bug that would cause dead or dying students to open doors. Students that die will now stay dead after being killed. Implemented several Senpai-related Game Overs. Fixed bug that would make Senpai walk in place. Fixed bug that would make the game hang after Senpai witnessed murder. Fixed bug that would allow the player to spawn the “Quit game?” window at the end-of-day screen, during the Senpai cut-scene, and while using the Pass Time feature. Fixed bug that would cause the Senpai cut-scene to play in slow motion if the player had Yandere Vision active while getting spotted by Senpai. Fixed bug that would cause Yandere-chan to be “insta-killed” by Senpai if she was using the Pass Time feature while in his cone of vision. Fixed bug that allowed the player to activate easter eggs during the Senpai cut-scene or while getting a game over. Fixed bug that would cause the police results screen and Senpai’s reaction to occur simultaneously. Attempted to fix the crash bug that occurs when activating the “Hatred” easter egg. The camera will no longer “fall through the floor” if Yandere-chan is noticed by Senpai on the second or third floors of the screen. If Yandere-chan loses more than two-thirds of her Sanity, she loses the ability to speak to students until her Sanity is restored. Fixed bug that would cause the game to hang if Yandere-chan had her camera out when getting spotted by Senpai. Yandere-chan can no longer trigger responses from NPCs or Senpai during “End of Day Results” screen. Students will no longer agree to follow Yandere-chan someplace if she is covered in blood. The game now tracks the number of murder weapons in the school properly. Unfortunately, I wasn’t able to make as much progress with the game as I wanted to over the past two weeks. Ever since the game got a huge boost in publicity, a large chunk of my time has eaten up by answering e-mails and comments about the game, so recently, I haven’t had much free time to actually work on the game. It’s really important to me to interact with the fans, so I read every e-mail / tweet / blog comment that I get, and I try to respond to every inquiry. However, this takes up a ridiculous amount of time; now that there are so many comments to respond to and questions to answer, my productivity has been reduced to a mere fraction of what it was in previous months. Regrettably, about 90% of the messages that I read are asking questions that I’ve already answered, reporting “bugs” that aren’t actually bugs, or making suggestions that I’ve already shot down countless times. If I ignored the fans completely, I’d get a lot more work done and make a lot more progress. However, I don’t want to ignore the fans! 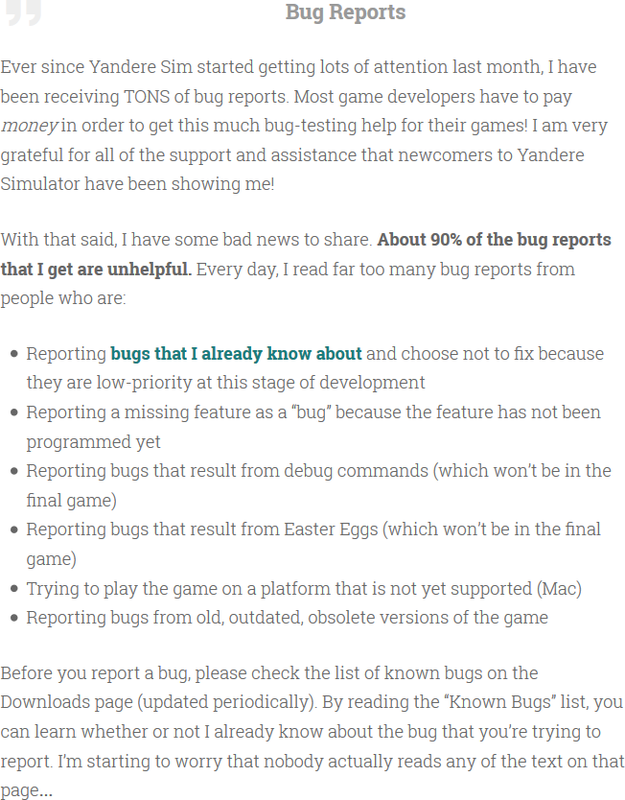 So, to make things easier for me, please don’t ask questions that I’ve already answered dozens of times, please don’t write unhelpful bug reports, and try not to suggest features that don’t suit the game, or are far outside the scope of a one-man indie game. Remember: Every minute I spend answering a question on the blog is a minute I’m not spending developing the game. As a result, you can speed up the game’s development by not asking me questions. Fortunately, not all of the messages I get are unproductive. 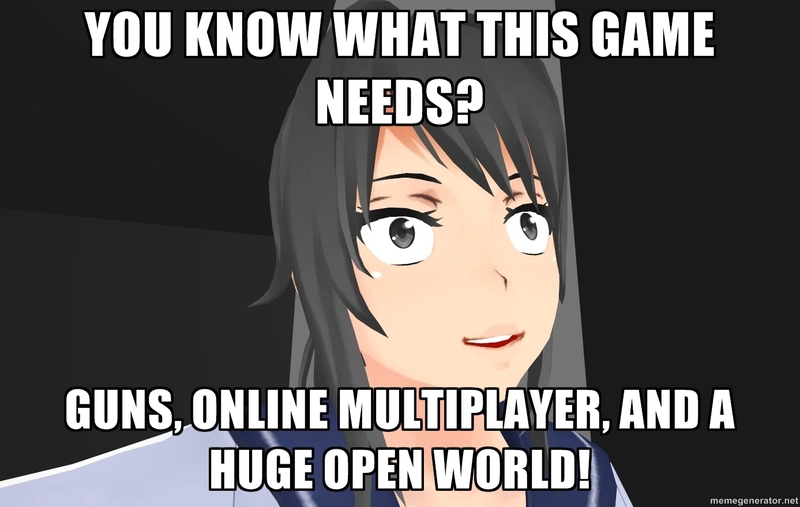 Over the past few weeks, I’ve received countless e-mails from very talented people who are generously volunteering to help with Yandere Simulator’s development. I’ve been speaking with 3D modellers, 3D animators, 2D character artists, sound designers, musicians, voice actors, and even singers. This is both a blessing and a curse; I’m blessed to be in contact with so many talented individuals who want to help me out, but answering so many e-mails means that I only have one or two hours left in the day to actually work on Yandere Simulator. So, even though I don’t have very much new content to show off this week, please don’t think that the game’s progress is slowing down. I’m starting to amass some REALLY cool 3D assets that I can’t wait to plug into the game, but they require a bit more polish until they’re ready to actually show off. You’ll start to see some really cool stuff in the coming weeks, as the new volunteers send me all kinds of awesome things for the game. As always, thanks for your interest in Yandere Simulator’s development! He fixed the bug is Saki working now?